Last time I wrote about the importance of a narrow focus, I considered writing this one about having a broad focus. I changed my mind when I remembered Michael Kline’s post “play the Pro” which was about how we are all hobbyists at times. Michael has been playing around with slip inlay, and spent quite some time with the work under wraps until he felt more confident with it. But this playfulness in the working process brings a level of joy. 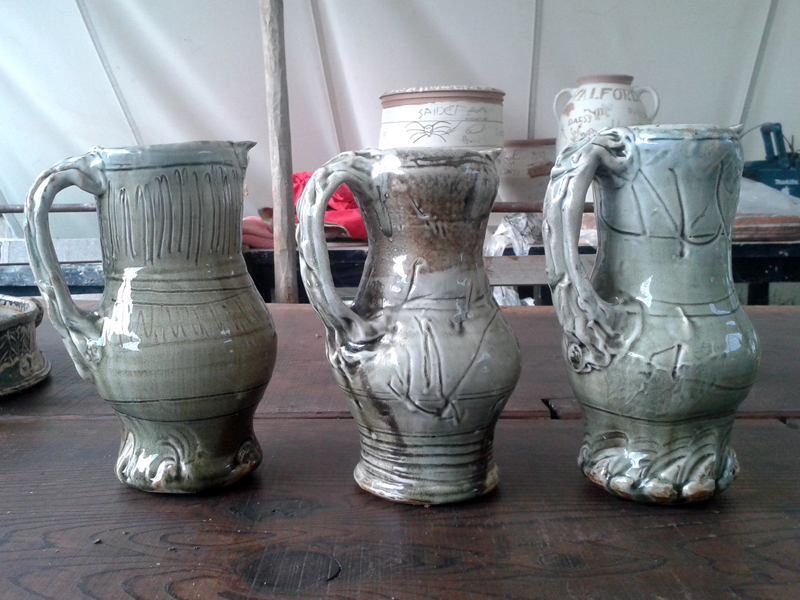 Having closed down Red Fox Pottery in 2012 I stepped away from clay to become an art teacher. 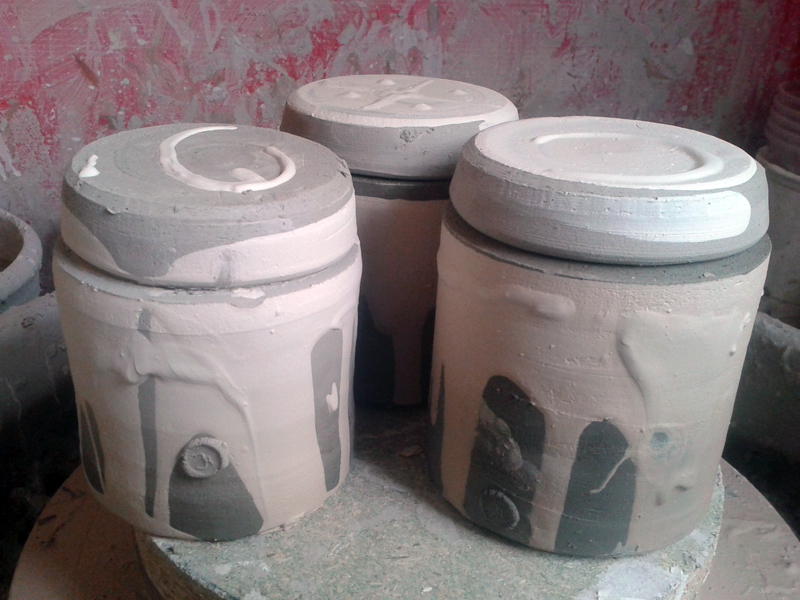 Teacher training didn’t afford much time with hands on clay, so I built up a bank of ideas of things I wanted to try. I also decided to take some short courses with Jeremy Steward and Nic Collins. I knew Nic’s work but I didn’t really know Jeremy’s work when I signed up. On the course every day the meals were served on a collection of handmade pottery, always a different plate and cup it really added to the experience. At Wobage water was served in three jugs that were seconds, there was one in the gallery and I couldn’t leave Wobage without it. 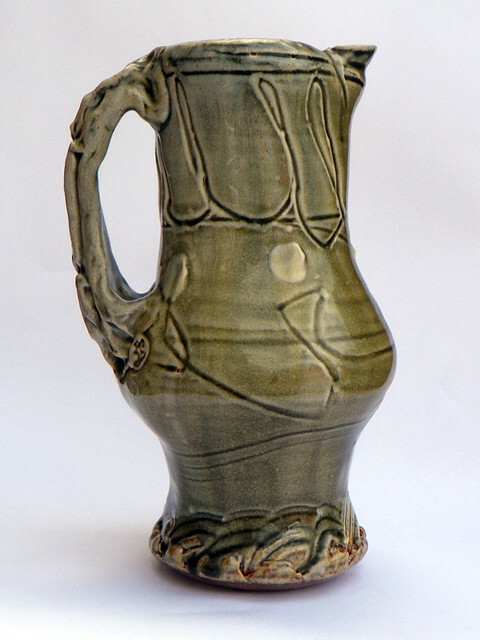 This Jeremy Steward jug really embodies what I was looking for in the way I make. I fell in love with his work at visiting Wobage after I had completed my teacher training. There is something about the handle and the looseness of the slip decoration I had to have it in my collection. There is still so much to learn from this jug but it will take years of learning. September 2013 I opened a bag of clay and started working through ideas. I can’t say anything was successful but it wasn’t about that it was about trying to recover from something that failed. At the same time what was I was looking for was this deftness of touch, the playfulness of marking marks in clay that I saw in the Jeremy’s work. I kept getting frustrated that I couldn’t touch the clay in quite the same way, so I stepped back from it and decided to give it time. Listening to Forrest Lesch-Middelton on Episode 104 of the tales of a Red Clay Rambler podcast relates a story about a student that wants to make more gestural pots. He told the student simply to make more pots, the student came back having made fifty pots and still thought they would never manage a looseness of touch. He goes on to relate it is nowhere near enough pots, it can only be learnt through doing over a longer time than this student expected. That is really what the last two years of making taught me, that I needed to make and then make some more. For most of the time I recycled everything I made reclaiming it in big bins outside my studio, and drying it out again in bisque fired bowls to use it again and again. I pushed my limits on a weekly basis never making the same thing for too long, I started looking for an idea I could stick with. I made things from cups, to jugs, flower bricks, coiled pottery and even more sculptural pieces. Slipped jars made in my own studio. I found things I liked and things I didn’t. One thing I decided I loved was slip but it a playful joyful loose way, where I was almost throwing it around coating every surface. Even now with my narrow focus of only making a few objects I am still playing with the decoration. There is a lot I want to try and get better at and I will play through these objects. 1) Take one of your pre-existing forms and play with the decoration, do something different. 3) Try to take the object out of the round changing the form subtly. Get out there and play try something new with something you already make, it will take some time so just keep playing even if it is with only one in ten objects that you make. This entry was posted in Making, Research, Slip and tagged ceramics, clay, jars, Jeremy Steward, jug, jugs, making, Nic Collins, Slip, touching. Bookmark the permalink.